Withdrawal and Discharge Water: Given a 100MW facility, 10-20 billion gallons of warm surface water and cold water from depths around 1000 meters would be used each day. The impacts of large water volume discharge need to be studied. The discharged water would be cooler, denser, and higher in nutrients because of the differing compositions of the deep cold water the the receiving waters. Water rich in nutrients like nitrogen and phosphorus would most easily be discharged into warm, oligotrophic water lacking these nutrients. How this change in compositions would affect ecosystem dynamics could yield positive or negative outcomes. Impingement/Entainment: Screens are installed in OTEC intake systems to keep large debris and species from getting into the facility. However, it can be assumed some organisms would get trapped in the intake screen (impingement) and organisms small enough to pass through the intake screen would end up trapped in the system (entrained). Both situations may result in the death of the organism. Biocides: The warm water in OTEC facilities requires a biocide treatment to keep efficiency in heat exchangers high. An example of such a biocide is chlorine. While the amount of such a biocide would be low and meet the standards of the Clean Water Act, the toxin would still cause some environmental impact. 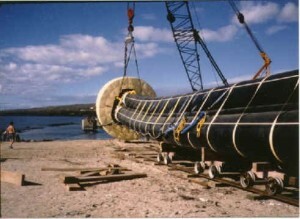 OTEC systems have cables emitting electromagnetic fields in the process of bringing the generated electricity to shore. The EM field could impact navigation and behavior of marine species. 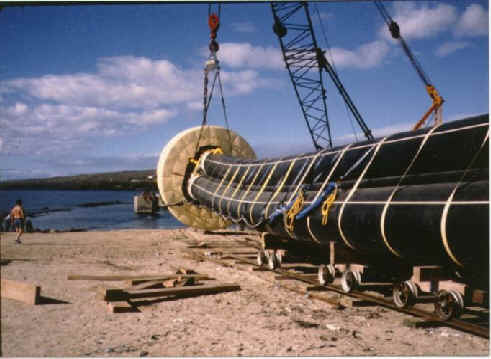 The physical platform of the system could attract or deter organisms, and its mooring would pose the threat of entanglement to marine organisms. OTEC facilities would emit an amount of noise pollution. To address impacts, new regulations for the licensing of OTEC facilities will be necessary, as well as an Environmental Impact Statement (EIS) for each proposed development. If the EIS does not meet standards, the application may not pass review. Reviewing the EIS requires the consideration of the direct, indirect and cumulative impacts the OTEC facility will have. It also takes into account how such impacts may offset the impacts of traditional energy supplies like fossil fuels. Reports including the OTEC Final Environmental Impact Statement (1981) and The Potential Impact of OTEC on Fisheries (1986) both seek to limit the environmental impacts of OTEC systems.